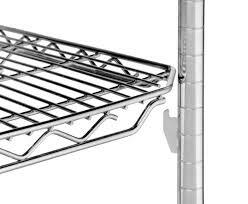 Storage cart shelving is available in various sizes are available for placement within our chrome security storage carts and units. Based on the model number and size of the cart will depend on which of our shelves you would need. Shelving clips snap easily into slots along post length to support shelves. Use as many shelves as needed where you need them to store all of your valuable supplies. For our mobile units on casters, we recommend our quikSLOT Locking Clip. Used to secure intermediate shelves onto posts when units are mobile. Comes 4 per package.